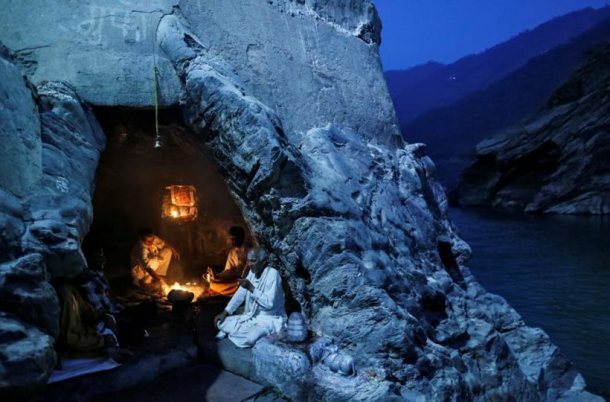 Hindu priests sit inside a cave as they perform evening prayers on the banks of the river Ganges in Devprayag, India, March 28. 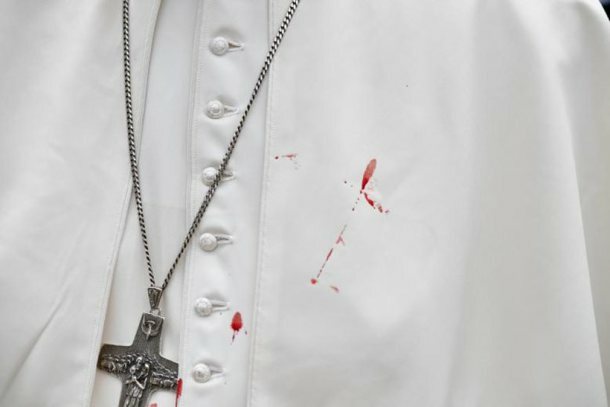 A few droplets of blood stain Pope Francis’ white tunic from a bruise around his left eye and eyebrow caused by an accidental hit against the popemobile’s window glass while visiting the old sector of Cartagena, Colombia, September 10. 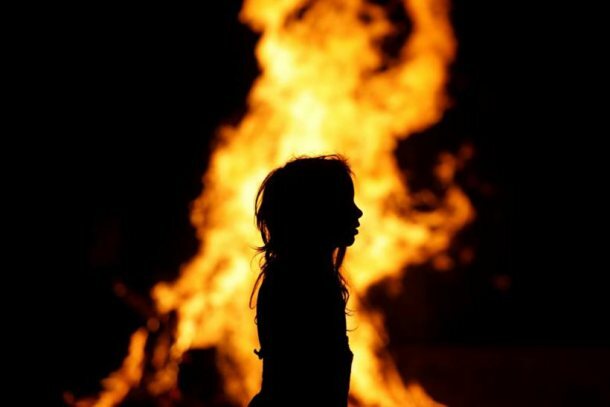 An Ultra-Orthodox Jewish girl stands around a bonfire as she celebrates the Jewish holiday of Lag Ba’Omer in the city of Ashdod, Israel, May 13. 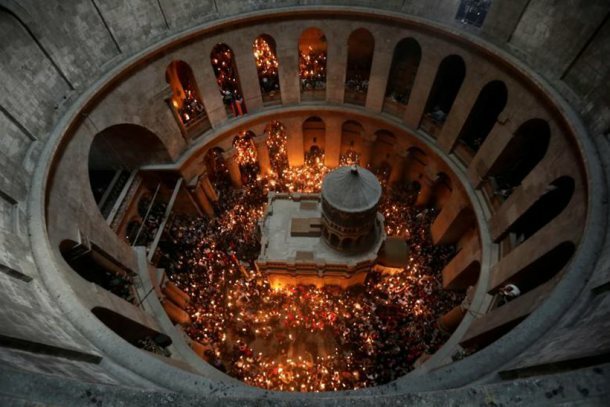 Worshippers hold candles as they take part in the Christian Orthodox Holy Fire ceremony at the Church of the Holy Sepulchre in Jerusalem’s Old City, April 15. 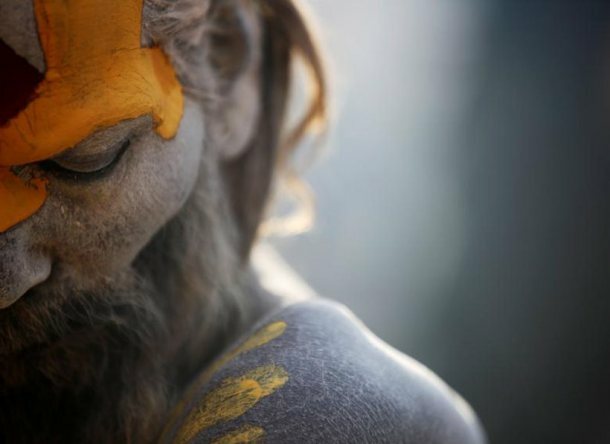 A Hindu holy man, or sadhu, smeared with ashes is pictured as he sits at the premises of Pashupatinath Temple during the Shivaratri festival in Kathmandu, Nepal, February 24. 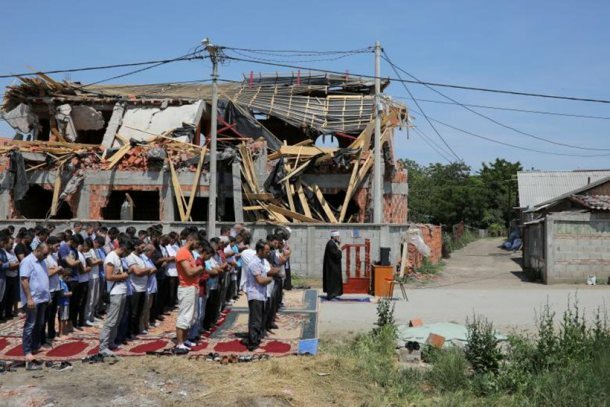 Muslims pray on a street in front of an illegally built mosque which was destroyed in the district of Zemun Polje in Belgrade, Serbia, June 2. 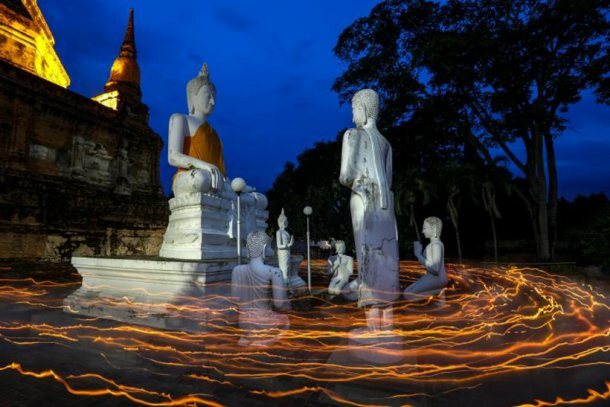 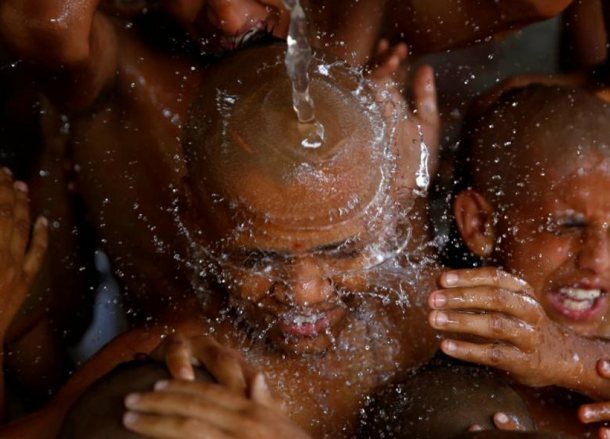 Young Hindu priests take a holy bath together as part of a ritual during the sacred thread festival at the Pashupatinath temple in Kathmandu, Nepal July 28. 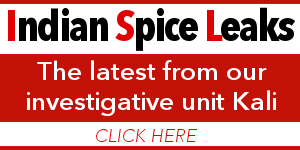 Hindus take holy baths and change their sacred threads, also known as janai, for protection and purification during the festival. 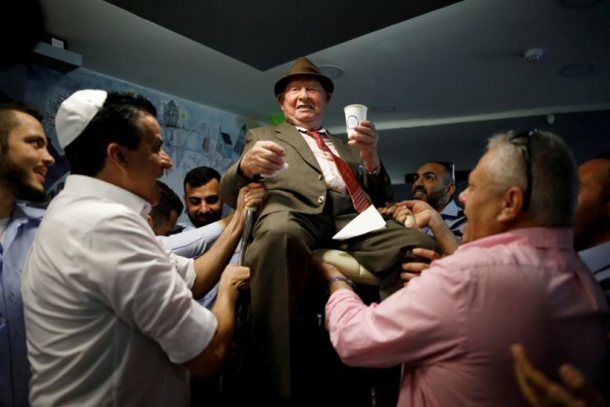 Shalom Shtamberg, a 93-year old Holocaust survivor, is lifted on a chair during celebrations marking his bar mitzvah ceremony, a Jewish coming-of-age celebration traditionally marked by boys at the age of 13, in Haifa, Israel, August 31. 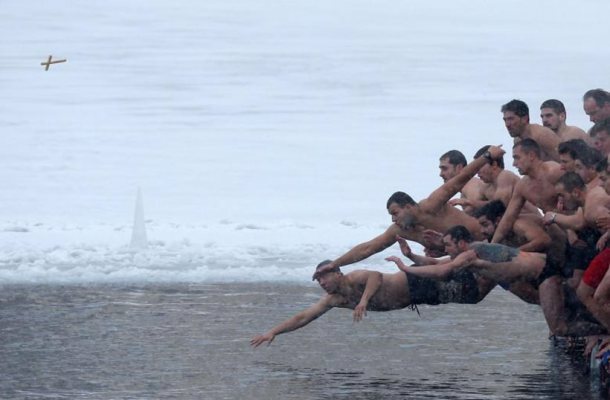 Bulgarian men jump to catch a wooden crucifix during Epiphany day celebrations in Sofia, Bulgaria, January 6. 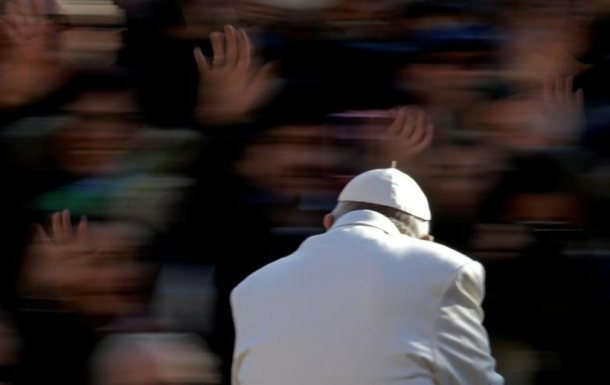 Pope Francis waves as he arrives to lead the Wednesday general audience in Saint Peter’s square at the Vatican, November 22. 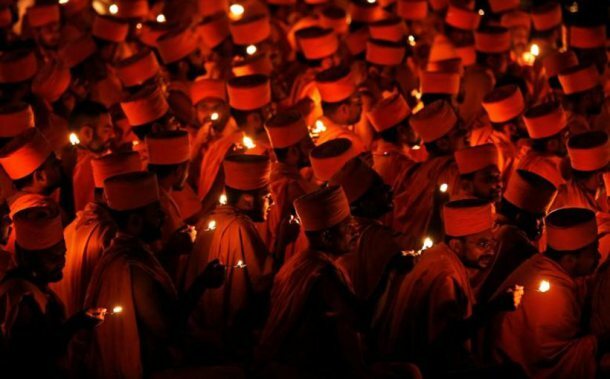 Hindu saints perform rituals to celebrate Akshardham temple’s silver jubilee in Gandhinagar, India, November 2. 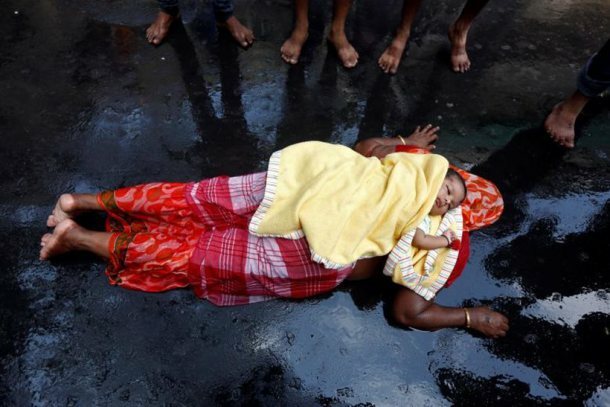 An infant lies on the back of a woman as she performs a ritual while worshipping Sheetala Mata, the Hindu goddess of smallpox, during Sheetala Puja in which people pray for the betterment of their family and society, in Kolkata, April 15. 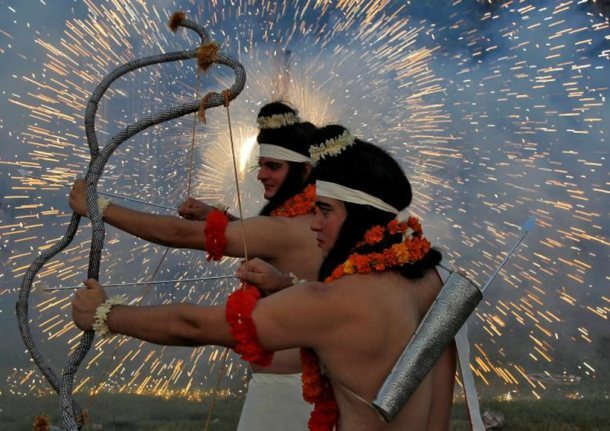 Artists dressed as Hindu gods Rama and Laxman act as fireworks explode during Vijaya Dashmi, or Dussehra festival celebrations in Chandigarh, India, September 30. 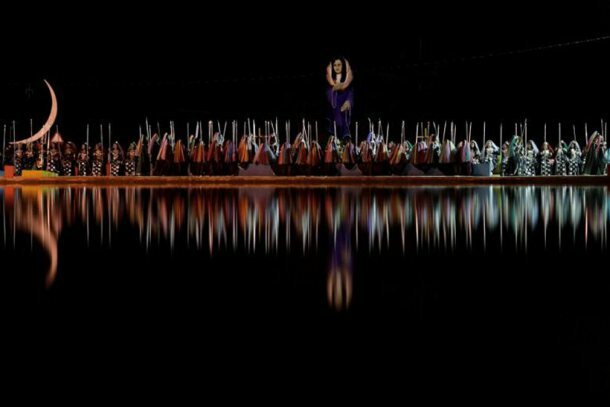 Worshippers attend the Day of the Spiritual Indoctrinator annual celebrations at the Vale do Amanhecer (Valley of the Dawn) community in the Planaltina neighbourhood of Brasilia, Brazil, May 1. 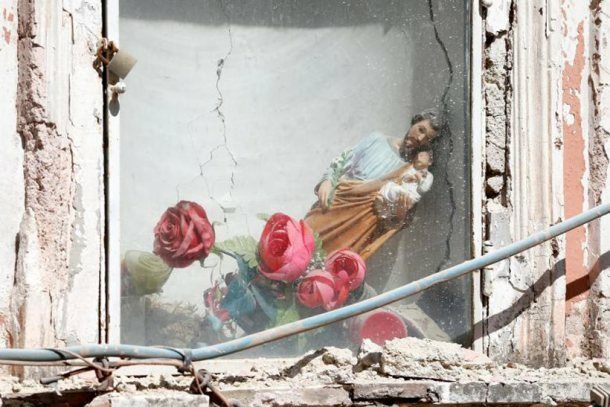 Revellers celebrate “Ash Monday” by participating in a colourful “flour war”, a traditional festivity marking the end of the carnival season and the start of the 40-day Lent period until the Orthodox Easter,in the port town of Galaxidi, Greece, February 27. 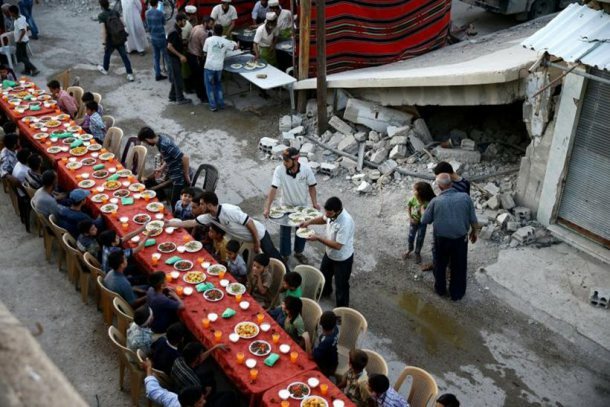 People gather for Iftar (breaking fast), organised by Adaleh Foundation, amidst damaged buildings during the holy month of Ramadan in the rebel-held besieged town of Douma to the east of Damascus, Syria, June 18. 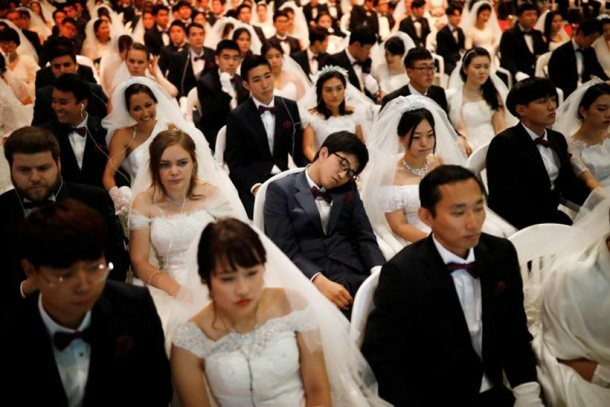 A groom naps as newlywed couples attend a mass wedding ceremony of the Unification Church at Cheongshim Peace World Centre in Gapyeong, South Korea, September 7. 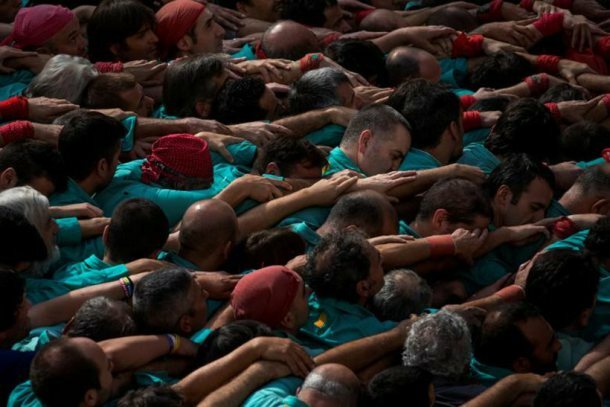 The group Colla els Castellers de Vilafranca form a human tower called ‘Castell’ during the All Saints Day in Vilafranca del Penedes town, near Barcelona, Spain, November 1. 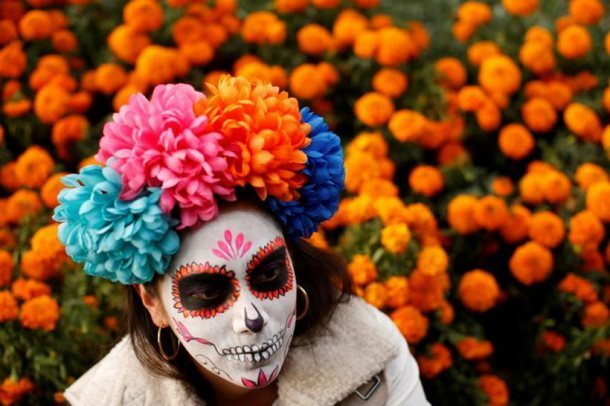 A woman dressed up as “Catrina”, a Mexican character also known as “The Elegant Death”, takes part in a Catrinas parade in Mexico City, Mexico, October 22. 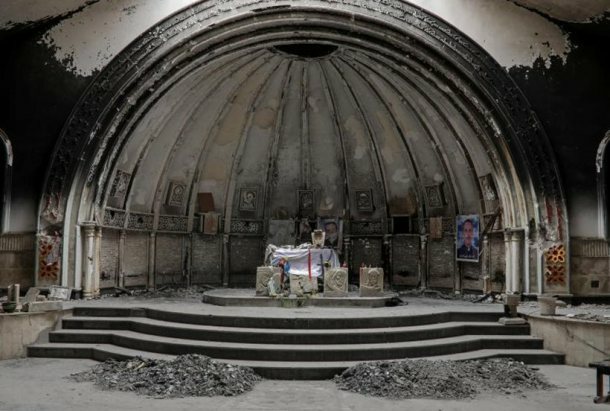 An altar of a damaged church is seen in the town of Qaraqosh, south of Mosul, Iraq, April 11. 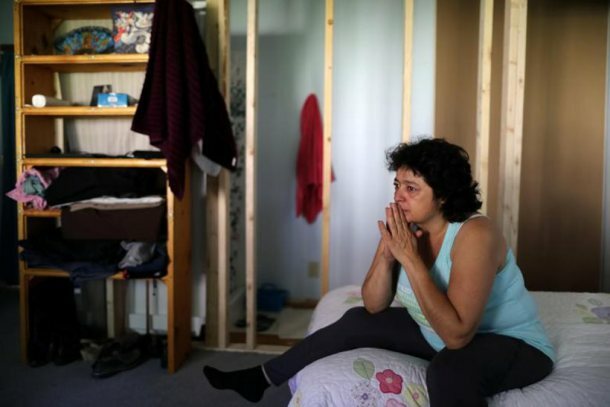 Immigrant Rosa Sabido, 53, cries as she sits on her bed in the United Methodist Church in which she lives while facing deportation in Mancos, Colorado, July 19. 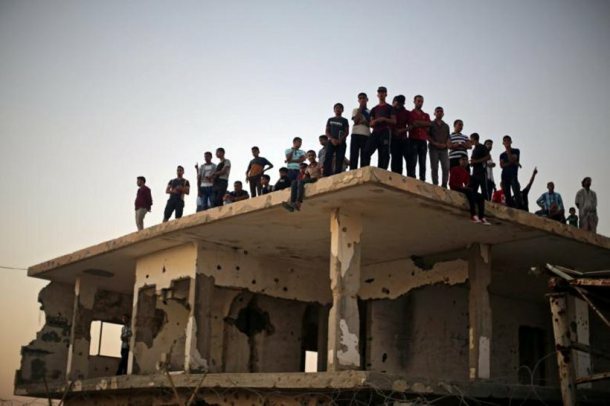 Palestinians stand atop a damaged building as they wait for the return of their relatives from the annual Haj pilgrimage in Mecca, at Rafah border crossing in the southern Gaza Strip, September 12. 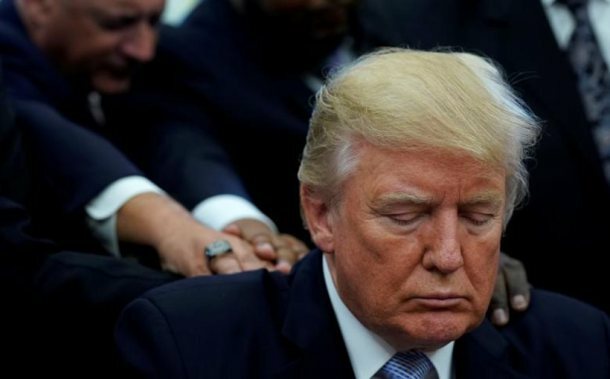 Faith leaders place their hands on the shoulders of U.S. President Donald Trump as he takes part in a prayer for those affected by Hurricane Harvey in the Oval Office of the White House in Washington, September 1. 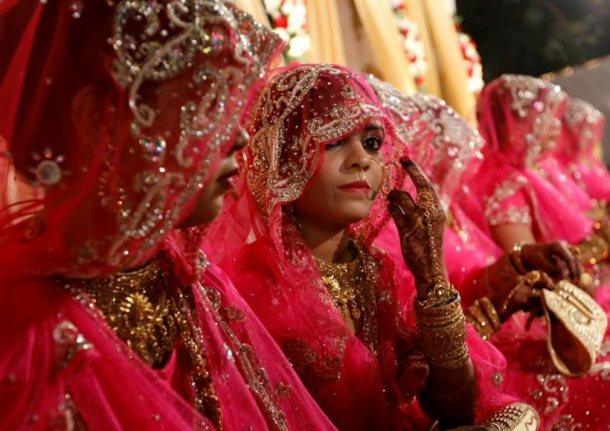 Muslim brides wait for the start of a mass marriage ceremony in Mumbai, India, November 20. 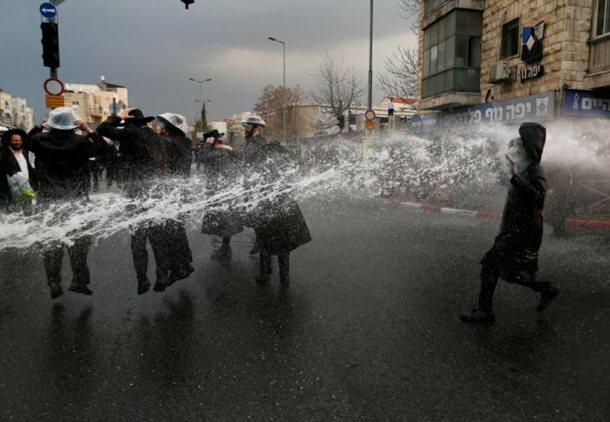 Ultra-Orthodox Jewish protestors are sprayed with water by Israeli police as they block a street during a demonstration against members of their community serving in the Israeli army, part of ongoing demonstrations throughout Israel, in Jerusalem, February 9. 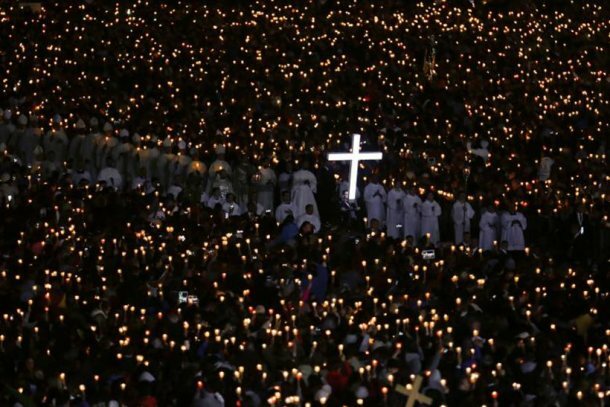 Pilgrims attend a candlelight vigil at the Catholic shrine of Fatima, Portugal, May 12. 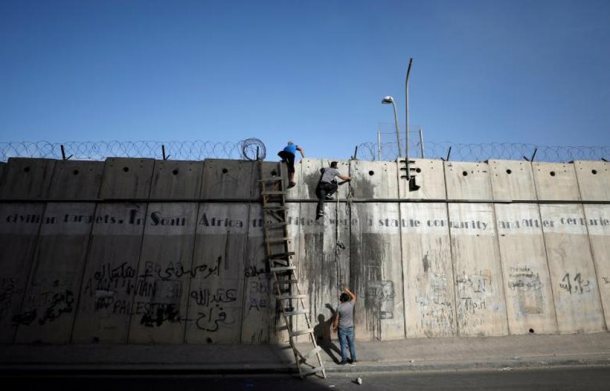 Palestinians climb over a section of the controversial Israeli barrier as they try to make their way to attend the second Friday prayers of Ramadan in Jerusalem’s al-Aqsa mosque, near Ramallah, June 9. 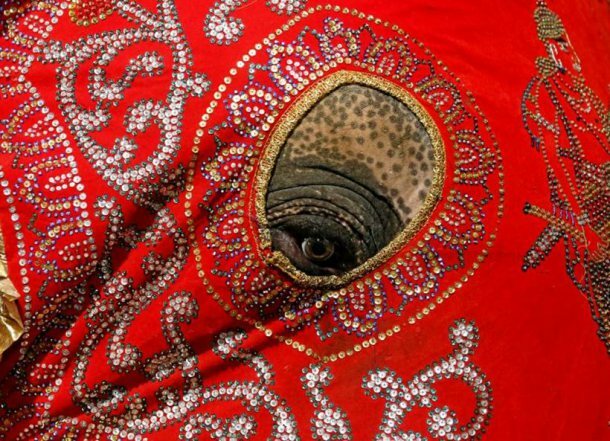 An elephant decorated with a cloth walk during the annual Nawam Perahera (street pageant) in Colombo, Sri Lanka, February 9. 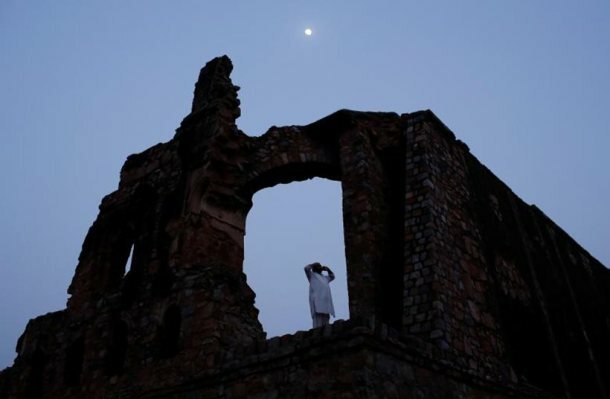 A Muslim man calls for the evening prayer after having his iftar (breaking of fast) meal during the holy month of Ramadan at the ruins of the Feroz Shah Kotla mosque in New Delhi, India, June 5. 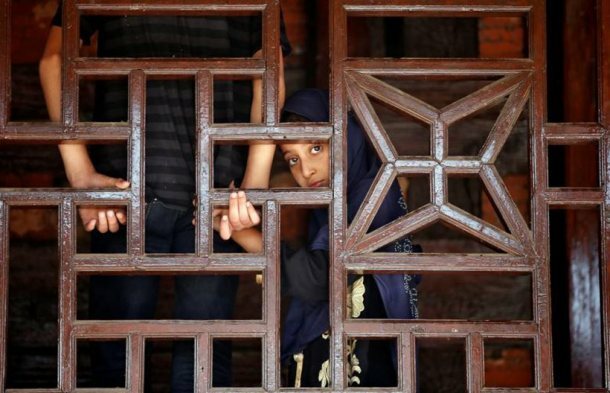 A Muslim girl looks on behind a wooden window frame at the shrine of Mir Syed Ali Hamdani, a Sufi saint, during an annual religious festival in Srinagar, August 29. 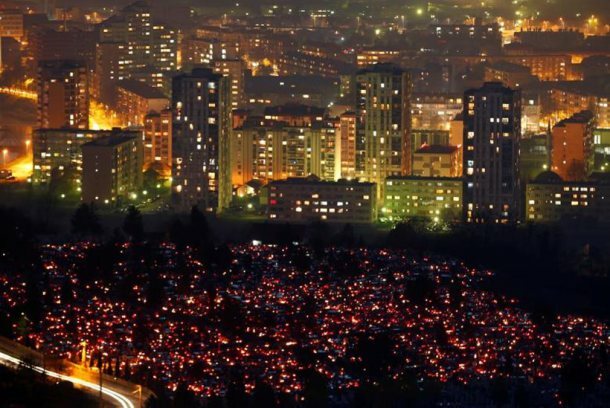 General view of cemetery on Crkvicko hill in Zenica, Bosnia and Herzegovina, November 1. 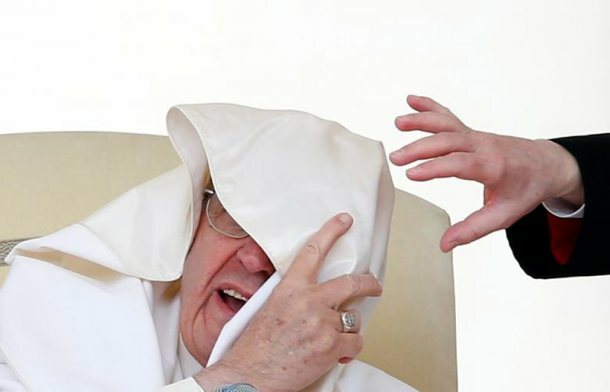 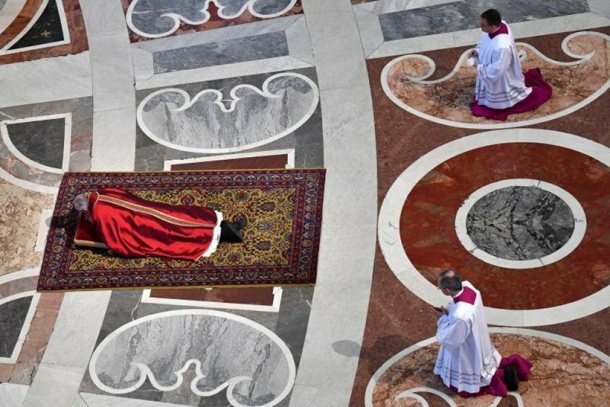 A gust of wind blows Pope Francis’ mantle during his Wednesday general audience in Saint Peter’s square at the Vatican, April 26. 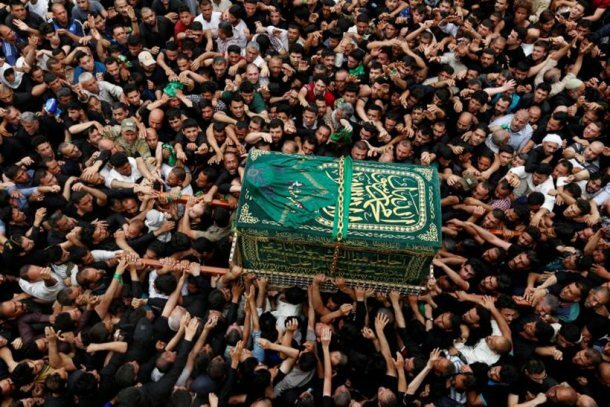 Shi’ite Muslim pilgrims carry a mock coffin during a symbolic funeral marking the death anniversary of Imam Moussa al-Kadhim shrine in Baghdad’s Kadhimiya district, Iraq, April 23. 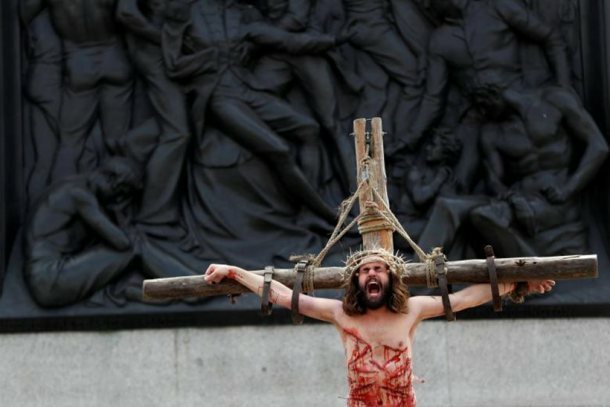 Actor James Burke-Dunsmore playing Jesus while performing in The Passion of Jesus at Trafalgar Square in London, April 14. 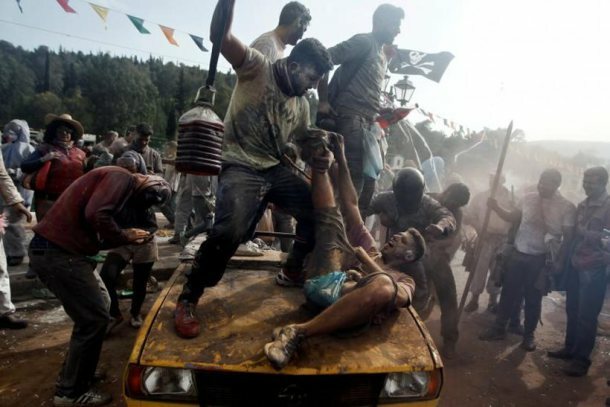 Shi’ite Muslim men beat themselves with their hands in mourning for Imam Hussein, a grandson of the Prophet Mohammed who was killed in a 7th century battle in Kerbala, in Kerbala, Iraq, September 24. 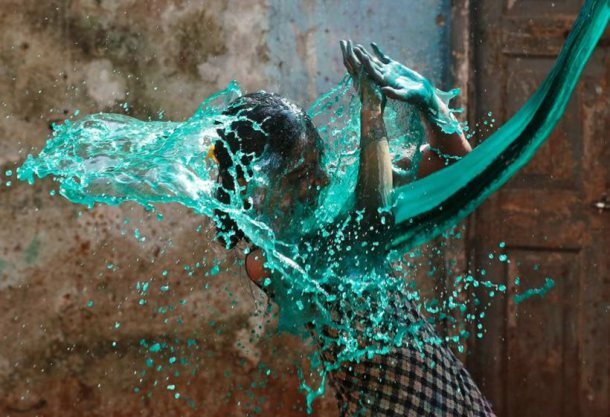 A girl reacts as coloured water is thrown on her face while celebrating Holi, the Festival of Colours, in Mumbai, India, March 13.